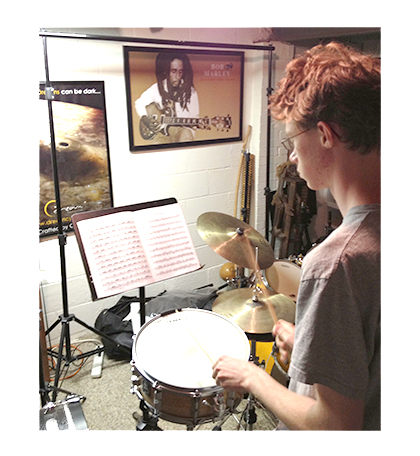 I teach individual drumset lessons both privately and at Goucher College in Baltimore, MD. I was the Director of the Drumset and Percussion Camp, part of the Goucher Summer Arts Institute, from 2006-2013, and I have taught and performed at Augusta Blues and Swing Week each Summer from 2014-present. 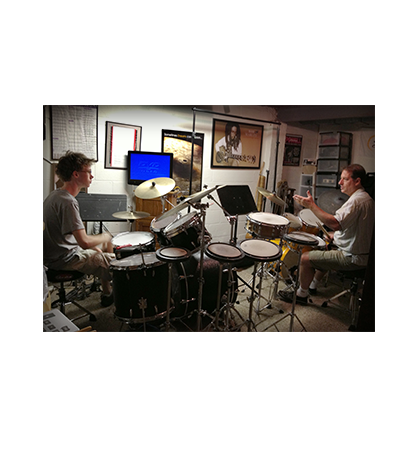 Private drumset lessons are held in my music studio in my home, located in Silver Spring, MD. Lessons are generally 30 minutes in length, but I will occasionally teach 45 or 60-minute lessons under certain situations. To view my policies, pricing, etc., please download my Lesson Policies. Generally, I teach using a sequenced curriculum modeled after a typical martial arts system of colored “belt” achievement levels which may be tailored to an individual's strengths, weaknesses and preferences. Students receive a free pair of Vic Firth sticks with the appropriate colored band around them as they achieve each new level! The Kit, by Jeff Salem, is the main book students use. This book includes rhythmic reading exercises, most drumset styles, drumset fills and breaks, as well as the 40 PAS Rudiments presented in a logical fashion. I believe that students learn best when they are having fun and when they see the relevance of their practice, so I attempt to assign exercises which are fun and realistic to actual performance situations while I also directly demonstrate where such exercises and practice may lead them. 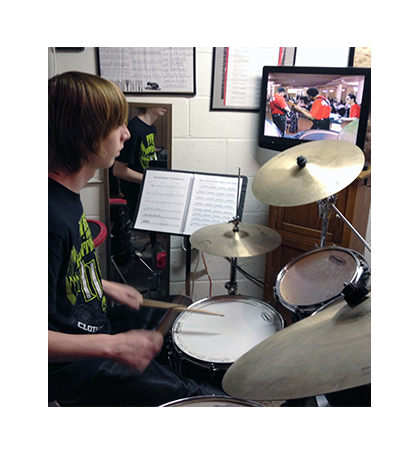 Consequently, I emphasize play-along media and have created my own "Wes Crawford's Drumset Play-Along DVD," DVD/CD package designed to shrink the performance gap a student often discovers between taking lessons and performing with actual musicians. I also use drummer/author Gary Rosensweig's books as supplemental material with students. Additionally, I have developed a “Rhythmic Murder Mystery" DVD - a text-based murder mystery which may only be solved by listening closely to the solo electronic drumset performances. I also offer a live version of this mystery and have performed it at various events such as the MD/DE and VA/DC Percussive Arts Society's Days of Percussion, the MD Music Teacher's Association, Spottsylvania County (VA) Music Teachers' Technology Conference, and others. My teaching studio is state of the art and includes a drumset with mirrors and a stereo system hooked up to a television with DVD player and You Tube, an iPod player with over 5,000 mp3’s as well as a variety of musical education apps, the Roland “Rhythm Coach,” multiple practice pads, a multitude of hand percussion and electronic percussion, video capability, and more! Parents and friends are welcome to wait in the adjacent waiting room equipped with a TV hooked up to a DVD player (always showing drum videos!) and sit on the comfy couch while reading magazines (only drum and music magazines are available)! Once a student enters the waiting room on the way to the studio, he/she will have no doubt that they have entered into a Total Drumming Environment! If you have any questions, please initially contact me at wesdrummer@msn.com. References are available upon request. Grid system is fully responsive and utilizes 6 fluid columns. It means that it looks perfectly on any device. Try to resize your browser window to see it in action. The following policies shall take effect as of September 2018. Let’s face it, in most performance situations, drum solos are infrequent and even unnecessary interruptions of songs, used mainly to placate an overeager drummer or to give the rest of the band members a break. Consequently, many drummers are afraid to take solos and have no idea how to effectively form them and communicate to an audience other than to display a laundry list of technical patterns and rudiments. No wonder drummers are the brunt of so many musician jokes! But what if we could solo utilizing tried and true methods and devices from the “melodic” world of music? You can make your own drum video the same way I did - without spending a fortune. This is an update of the same article published in Drum Pro Magazine. "Hi! I'm 28 years old and I've been taking lessons through Wes for 2+ years now. Wes is a natural born teacher, blessed with endless patience and marvelous people skills. No matter your age or challenge (physical or mental), Wes has the experience and know how to best guide you to the path of drumming greatness! Wes is honest and deeply cares about each of his students. Wes also helped me buy a drumset (an expensive and daunting task mind you!). 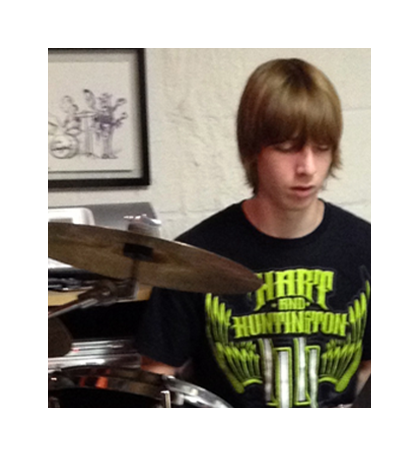 If you're looking for an experienced, patient and amazing person to teach you drumset, Wes is your guy." "Wes Crawford is an amazing professional. Not only is he a great teacher, he also has many years of performing experience to share with his students. He's a caring, passionate educator and percussive arts visionary, and truly helped shaped my career." "I am one of Wes Crawford's older students at age 50. I have been taking lessons from him for over 5 years. Prior to this, my daughter, in 6th grade at the time, took lessons for a year. We were both novices when we started. 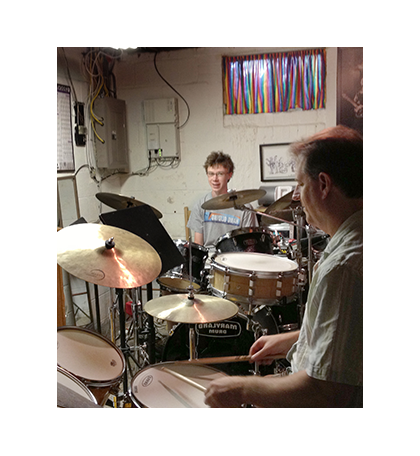 Wes is a great drummer who performs regularly with jazz groups. He is also an excellent, very organized, teacher who devotes much thought into effective teaching methods. He is very patient, always encouraging, never demeaning to students regardless of their talent. His studio basement has 2 full drum kits, so he can demonstrate techniques on one while the student is on another. I would highly encourage anyone -- from novice to an advance player -- to take lessons from Wes. You will be happy you did." "Wes Crawford is an extremely dedicated musician and teacher. He lives and breathes his craft. Wes is a patient and encouraging instructor. He not only accommodates all skill levels, he draws the best out of each student." "Music operates on different levels for different people. Wes encourages students of all levels, adapting to their specific needs. He really is one of the most encouraging, as well as capable!, teachers I've ever worked with." "I would highly recommend Wes to anyone, any age. I started with Wes right before I retired. I hadn't touched a drumstick since I was in my early 20's (in my 70's now). In less then a year I was playing in a big jazz band with 25 pieces. Wes is a very caring person and a great drummer himself. I always looked forward to spending and hour with Wes at my weekly lesson. He has lots of performing experience in all genres. This man is a super teacher and works well with all age groups. He is a teacher to love." "I had gotten back into playing the drums a little later in life. I realized I needed professional instruction. Soon after coming to see Wes, fellow musicians remarked on my improvement. This motivated me to learn different styles. I play in two bands now and I plan to return to Wes in the near future to take it to a new level. Thanks Wes!" "Patient, professional, thoughtful, completely dedicated. I loved my son having the opportunity to have recitals. Encouraging, supportive. I recommend Wes to anyone who mentions an interest in drum lessons. We love Wes! You will not find a better drum teacher!" "I have taken maybe ten lessons with Wes. Wes is a very kind and compassionate teacher. He is very helpful and observant. Wes is also a great drummer." Bach To Rock - Bethesda location, hard to park and traffic is a beast. There was a regular rotation of teachers which was disappointing to my son/me for a variety of reasons. There were consistency issues, redundancy which lead to boredom since one teacher did not know what the other teacher had taught. Can't remember the price, but monthly billing via credit card for 30 minute lessons. School of Rock - Downtown Silver Spring. Very nice, friendly and attentive staff. Again, there was a rotation of teachers. One disturbing thing for me was to find my then 5 year old son standing outside with the drum teacher while he (teacher) smoked cigarettes. this happened more than once. Not quite the role model and/or environment I wanted for my young son. Since I was paying for this time, I was livid that my son was not practicing the drums observing a smoker. Finally, the program is supposed to lead to your child playing in a band after a few weeks. Since my son was so young, they were never able to place him with a band. Most of the other students were teen, pre-teen. Not exactly ideal for a 5 year old to hang with. Monthly billing for 45 minute lessons. In my opinion, 45 minute lessons are too long for a 5 year old. The lessons were pricier than Bach to Rock. Wes Crawford - Teaches out of his home in Aspen Hill. 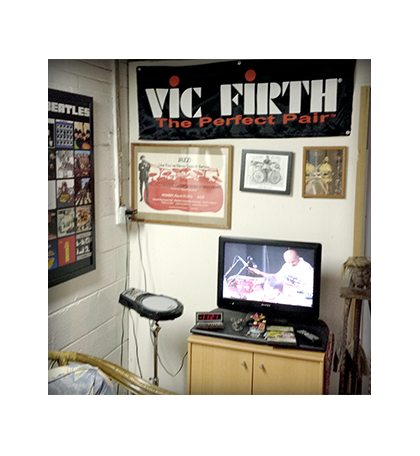 He has a basement full of percussion items as well as drum kits so kids are exposed to all sorts of instruments. He is very kid friendly in his voice, demeanor, patience, etc. Kids are exposed to all genres, jazz, rock, etc. My son thinks the lessons are fun and looks forward to going there. There is no credit card billing option and you pay up front for a month of lessons. There is a waiting room in his basement for parents to listen. We have been with Wes for more than 6 months now and are very pleased. If you try him out, tell him Anna's family sent you. "(My son) loved it. When can we start lessons with you?... We are definitely on for next year!!.. Thank you for putting a smile and color back into (my son's) face and dreams!" Former students go on to achieve great things! MIKE BIRNBAUM graduated in Music from the University of Hartford Hart School of Music and performs and teaches out of the Northeast. TIM GLENSHAW currently attends Temple University on a full scholarship with a dual degree program in Jazz Drumset and in Physics. ADAM LaROSSA has worked in audio and game production (with audio credits on Civilization 3: Warlords ) in Baltimore, Atlanta and NY and toured Southern CA as a drummer in a regional band. JAKE MARINARI performs for the R&B act Bosley throughout the Mid-Atlantic, as well as various Jazz combos around Baltimore. ALAN MUNSHOWER Alan Munshower is a busy Jazz drummer and teacher in the Baltimore / D.C. region. LYLE NESSE graduated in Music Business from NYU and performed in Gangi, an LA based recording duo that received a lot of attention and performed nationally (photo credit: Dan Monick / LA Record). MATT NORRIS played drums with the Christian Rock band Watermark and toured throughout the US and Europe. Ele Rubenstein graduated from the Jazz Studies program at Temple University and regularly performs throughout the Washington, DC, Baltimore, and Philadelphia areas. CHRISTIANA USENZA performed and recorded regularly with her Indie Rock band, Mr. Moccasin Mr. Moccasin Music , around Baltimore. in 2012 she completed her Masters Degree in Ethnomusicology from Tufts University in Boston and studied in Ghana. JEREMY VEST has studied with me for over fifteen years and stars in a Matt Stone MTV show called "How's Your News?" Jeremy plays drumset in the "How"s Your News?" band and performs on the theme song of the show. DONNIE WILLAMS tours nationally and internationally with Lloyd Dobbler Effect. Justin Wolf holds degrees in Music from Willian Paterson College (BA) and SUNY Purchase (MA) and performs and teaches throughout the NYC region. He is a member of Iktus Percussion.